California duo's harmony-tribute to the 'lost' songs of the Everly Brothers produced by Mark Linett and featuring Dave Alvin, Elliot Easton, DJ Bonebrake and more. “It’s easy to overlook the Everly Brothers because they’re everywhere and we've all heard the songs often over the years,” explains Frank Drennen, one half of the California vocal duo DEAD ROCK WEST. “But this time was different.” Kismet played a big role in Drennen and Cindy Wasserman (the other voice in Dead Rock West) coming to record It's Everly Time!, their 13-song tribute to the Everlys (with two iTunes bonus tunes) with Grammy-winning producer Mark Linett (Brian Wilson, Jane's Addiction, Los Lobos & Rickie Lee Jones). After their first album, ‘Honey And Salt’ garnered great critical praise in 2007 and tours with legendary Artists like LA punk rocker X, their second album to be recorded was Bright Morning Stars, a collection of California spirituals and old-time gospel, produced by Peter Case and featuring contributions by John Doe and Exene Cervenka, artists who Cindy had begun to work and tour with as well. In between tour dates to support ‘Bright Morning Stars’ in 2010, they recorded ‘It’s Everly Time!’, but real life tragedy intervened when Frank's mother fell ill followed by the sudden loss of his brother, and then the loss of Cindy’s father in quick succession, sidelining them both from road work, and the release of It's Everly Time! was understandably put on hold. 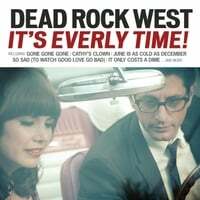 Now, launching a new label, Angel Flight Recordings to celebrate the long-awaited release of It’s Everly Time!, DEAD ROCK WEST not only takes charge of its catalog, they’ve reignited the creative vocal spark that defines who they are as artists and are heading back out on the road to sing the harmonies that they love so much. Love this album! Frank and Cindy's voices blend beautifully together and fit perfectly with the songs! Great vocals, great melodies, great album!